Chart based on 59 repairs. 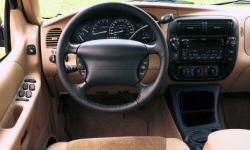 See TSBs and recalls for the 2000 Ford Explorer. Chart based on 47 repair trips. The repair cost chart excludes repairs made under warranty, do-it-yourself repairs, and repair trips that include maintenance. US $24 Replaced steel cross brake line between rear wheels and bled system. Old clips were somewhat difficult to reach and they were also rusted so zip ties were used with insulation around lines as a substitute. US $30 serv engien light, running rought, just put set of new plugs in it and ran ok. also the front left wheel bearing may be failing, makes a growling noise. 201000 mi Growling wheel bearing. US $75 the Universal joint went bad after moving a heavy load. Easy Fix. Quick repair. 148800 mi Transmission was slipping, especially driving in the city. US $120 Low voltage light went on, faulty alternator. Repair was easy with three easily accessible bolts. C $450 Front driver's side lower ball joint replaced. US $500 Coolant leakage around the thermostat housing. Housing replaced. Front wheel bearing worn and replaced. Major engine belt replaced due to wear, original belt. Hood shocks would not hold up hood. Shocks replaced. US $550 Back wiper would not work. Indicated it was the motor but it works. 150000 mi Replaced electrical motors for electric windows on the left side of the car as both had stopped working. Replaced electric mirror on left side of car which quit functioning when the motor stopped. Whole mirror assembly replaced. US $2500 Hole in the end of the right head opened again and leaked out coolant. Scraped out old epoxy and replaced with new. A new leak in the radiator was repaired with stop leak until a new radiator is put in. Lost 2nd and 4th gear. Took to Earlington transmission who diagnosed a broken 2nd gear band plus other worn parts in the transmission. They rebuilt the transmission. 131000 mi Rear wheels rusted through, rears doors also rusted badly. US $350 Had to replace both front wheel bearings. Horrible noise coming from it. Much quieter ride after the replacement. See our lemon odds and nada odds page to see vehicles with no repairs or vehicles with more than three repairs. 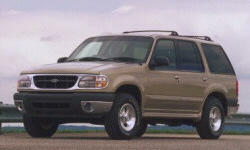 To see how frequently 2000 Ford Explorer problems occur, check out our car reliability stats.